NON-TOXIC & PERFECT SIZE - ABS plastic material is smell-free and safe to kids. BRUSH ANTI LOST DESIGN - The board is with a nice frame that holds the pen and stamps in place to keep organized. EASY SLIDE ERASER - Gently slide the magnetic brush at the bottom to remove all drawings easily. Kids can use their imagination & creativity to create endless drawings and paint all day! Perfect for Write and Learn - The magnetic drawing board is perfect for Drawing and Writing Activities, exploring Child's creativity and practice coordination. Not suitable for kid under 3 years old. We promise to offer good quality products to make you satisfied. We make every effort to provide quality services. Please contact our customer service if there's any problem. 100% satisfaction or get your money back. We will do whatever it takes to make sure you are happy! SAFE METERAIL & PERFECT SIZE - Magnetic Drawing Board Toys for Girls is made of high quality ABS plastics materials, tasteless non-toxic and durable. Board dimension: 38*3.6*33cm; the doodle screen is 26.5*19cm. 4 STAMPERS & 2 ERASERABLE PENS - This Magnetic Drawing Writing Board For Kids comes with 4 shape stampers: Square, Triangle, Circle and Flower shape, which makes it possible to create cute and beautiful shapes. With the 2 different colors pens, kids can write or draw to meet their different needs. Kids will enjoy the 4 different shape stampers to write and get in the creativity zone with this color doodle writing board. STYLUS ANTI-LOST DESIGN - The Large Magnetic Drawing Board Whiteboard Writing Pad is specially designed a tray to store the pens , which is convenient for use and easy storage. The magnetic drawing board will be great for you to keep organized and no worry about losing the stylus. EASE SLIDE ERASER - The slider eraser is very effective at removing the drawings. Just one swipe back and forth, doodles will be easily wipe out. Kids can do it on their own with imagination and creativity to create endless drawings and paint freely! 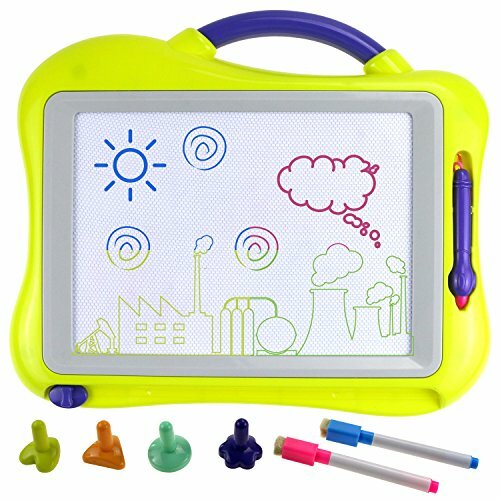 EXPLORING CHILD'S CREATIVITY - The magnetic drawing board contains 4 color areas green, yellow, red and blue, which helps children's perception of color, promote the development of children's personality. Perfect for pretending school play and have the neighbors over for a fun day.